As more and more Pisound related projects are popping out on the Internet, we should have a dedicated thread here just for Pisound-in-action type of pictures and videos. Touch_tft_lcd shield allows for use of pisound shield? @giorgiodistante, care to elaborate more on what’s happening under the hood? 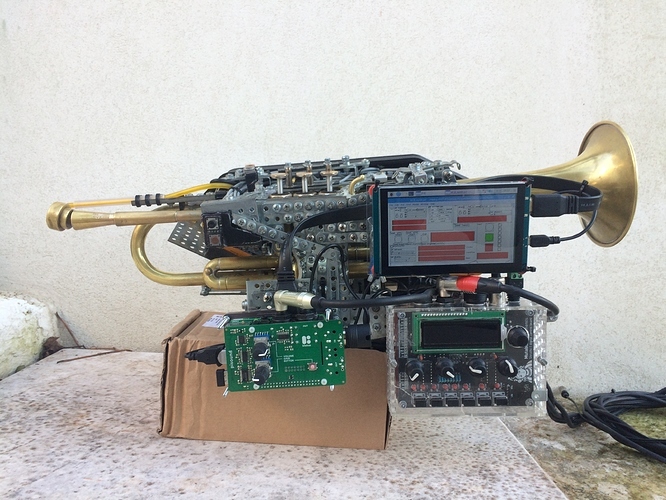 The metallic structure on the trumpet is made with Meccano elements. The apparatus consists of a MIDI wind controller blowed by the the yellow tube on top that sends messages to the little synth onboard. Then the sound of the acoustic trumpet and the synth goes into an external mixer. From the mixer both sounds goes inside the Pisound via the AUX-send channel and from there the magic begins. 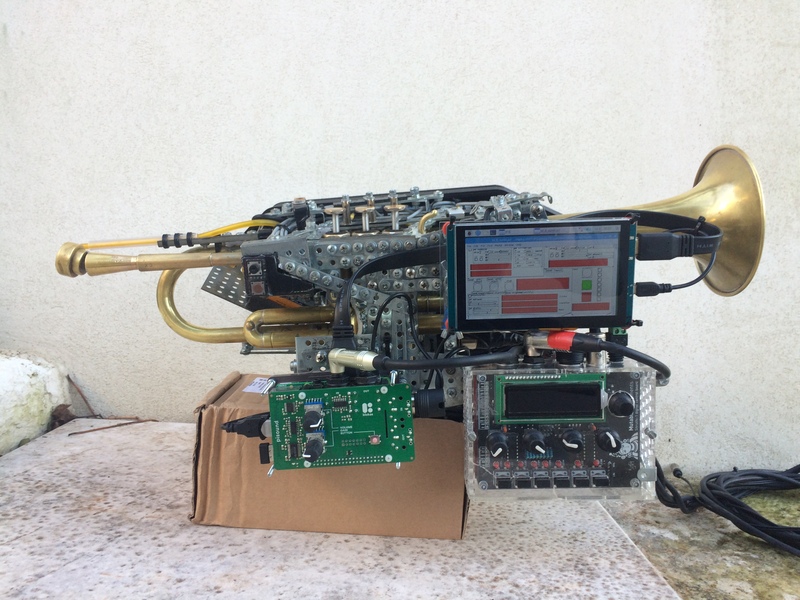 Pisound receives MIDI signals from the little synth also (controlled in turn by the wind controller) and it sounds great! Excellent quality, no latency, no rustles. On the raspberry I’m using various instances of Pure Data to manipulate both sounds and I can control the various PD parameters using the 5" touch display. Pisound was a real turning point for the evolution of my instrument. I have to thank @Giedrius for all the support, otherwise I would have gone mad! Not as exciting as the amazing post-apocalyptic trumpet above…but here is a photo of my minimalist pedalboard. 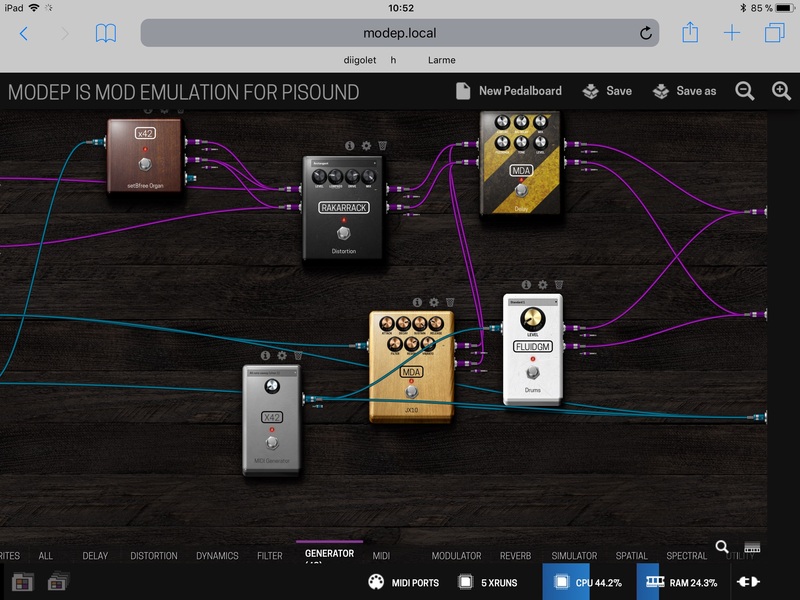 Pisound is being used for reverb, delay, and cabinet simulation. Particularly interested in the breath control part. Do you have details of that part of the build, somewhere? My setups aren’t as impressive as @giorgiodistante’s. But it’s still fun to share. 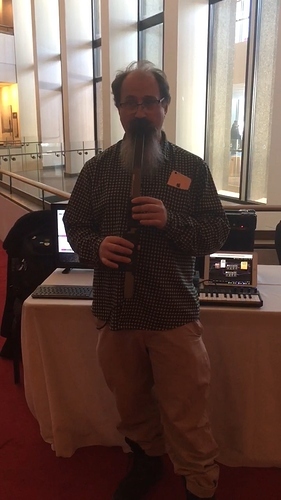 A few weeks ago, used these setups at the National Arts Centre for a Maker Faire in the “Symphony Hack Lab” context, before family concerts of the NAC Orchestra. Also used them this weekend at the Canadian Museum of Science and Technology for Ottawa’s first Raspberry Jam. We’ll do another Jam next Saturday (March 10). One pisound setup is demoing the “Sonic Minecraft” example Sam has included in the article about Musical Minecraft, contained in the Sonic Pi tutorial. In that case, Sonic Pi puts blocks in Minecraft and moves the character in beat with a simple loop. It tends to tickle the curiosity of several kids who like Minecraft, allowing me to spend a minute telling them about coding. The other pisound setup is running a simple pedalboard in MODEP. The MIDI input from my Yamaha WX-11 wind controller drives a preset in the JX-10 plugin with breath control linked to the cutoff frequency of a lowpass filter. Allows me to play all sorts of crazy sounds, which really gets people intrigued. Playing with this as people pass by has felt very close to busking. For instance, when toddlers or babies would pass by, would play some notes below the audio range in small little bursts to produce didgeridoo-like sounds. When teenagers were coming through, would play something closer to a lead guitar. With adults, might play some short melodic phrases as a kind of call. An Alesis Vmini keyboard plugged into the same MODEP setup drives the SetBfreak plugin. Kids would come along and play the keyboard. At the NAC, several kids had enough knowledge of the keyboard that they were playing quite deliberately. My fun then was to jam with them. Looking at their fingers helped me figure out what they were playing (my ability to pick things up by ear isn’t that great). Even finished an academic article with an anecdote on this. At the NAC, kids often tried turning the knobs, which weren’t connected to anything. For the Raspberry Jam, assigned the knobs to different controls in the rkr distortion plugin (drive, lowpass, highpass, mix). 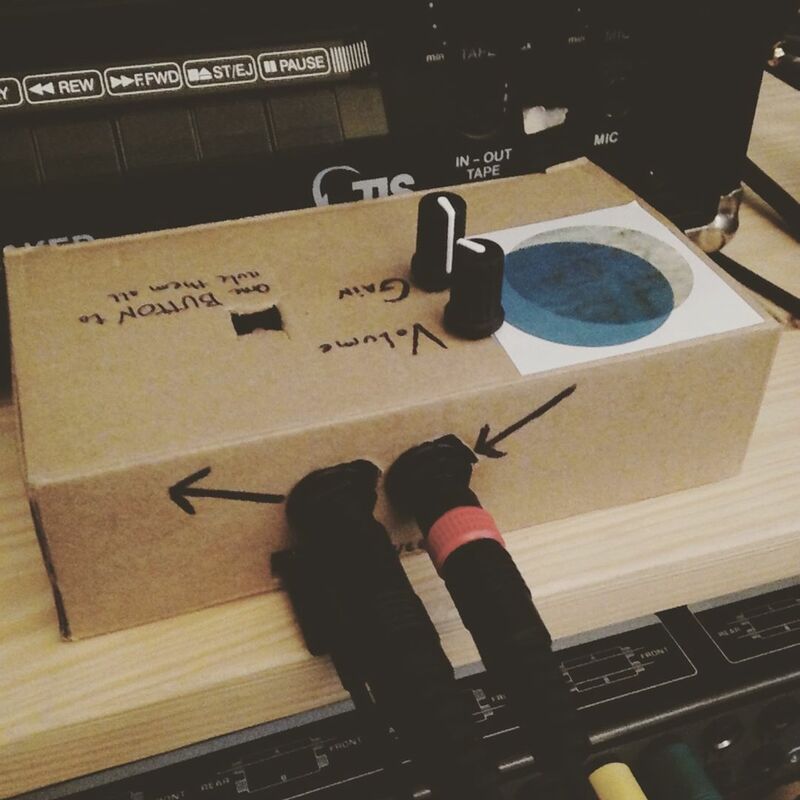 Several kids played with the knobs, exploring how a distortion can transform the sound. Since these controls interact with one another and some of them can make it so that there’s no effect, kids were a bit puzzled until some tweaks were made so that the effect would hold. Overall, those setups have been quite successful at generating very quick learning sessions. Been doing extended workshops about Sonic Pi, which have had quite a different effect. But in terms of getting kids and their parents or tutors to grasp a few high-level ideas, it has been quite effective. Something people have asked is about the connection between my two setups. Hadn’t connected them at all. Just asked this group about my options. Will probably connect the MIDI out of the MODEP setup to the MIDI in of the Sonic Pi one, filtering out active_sensing in MODEP (there’s a plugin for that! ), and telling Sonic Pi to put blocks in Minecraft and change scales all based on the incoming notes. Had only thought to do this with the WX-11. But it might make sense to also have that with the keyboard. Kids are likely to have fun seeing blocks appear in the sky as they play the keyboard. It might also make sense to have the audio from Sonic Pi routed through MODEP. In my original Sonic Pi setup, sound goes through HDMI which decreases the usefulness of the pisound HAT (people at the museum have asked me about this). For diverse reasons, haven’t spent much time at all preparing for these events. The fact that they’ve worked pretty well is part of it. But this might be a good opportunity to add a few “bells and whistles” before Saturday. Will bring my MODEP setup to a (music) jam with friends, on Wednesday, which might also give me some ideas. Will try to post a better excerpt. So, again, not impressive. But rather effective in terms of my goals. MIDI to OSC? Other Ways to Communicate between Pis? I’m trying to build something similar, can you share more details? For one thing, MODEP was stable throughout both events with very few xruns. There were a couple of issues, though. One is that there were some stuck notes from the keyboard. Sounded like it had to do with kids playing “clusters” or otherwise just pressing multiple keys at the same timethe. On occasion, the JX-10 sound would change, either shifting octaves or changing altogether. It was quite strange. Switching the patch back and forth worked. Sonic Pi stalled a few times. There wasn’t any sign that things were going wrong (no error in the SPi console and no lightning bolt or thermometer in the display). Started with three buffers running at the same time (MIDI in to Minecraft, MIDI in to countermelody, and a simple loop). After the first time it stalled, focused on a single script, the one using incoming MIDI notes to put blocks in Minecraft. It got significant lag after a while and eventually stalled completely (the mouse pointer not moving, etc.). Altogether, it was fun, stimulating, and interesting. Several people inquired about my setup, including the pisound HAT specifically. Despite the latency, using MIDI to connect between the two pisound-based setups was a convenient way to get things to work. Will surely modify this whole installation quite a bit before the next event. One part would be about getting “rotating chords” to play from incoming notes (à la Michael Brecker). Did this with Sonic Pi but there should be a way to make this work in MODEP. Thanks for your reply ThirdMountain! I’m mainly interested on the cabinet simulator, are you using IRs? The one I am using is called ‘Tweedy’ so fair to assume it is an impulse response from a tweed style amp. It sounds excellent in my opinion. Just a monosynth, with 24 different waveforms (8 types, each calculated up to 6, 12 or 16/18 harmonics).